LOCATION:	 Idaho Falls, Idaho, U.S.A. I grew up in France by the sea, camping and backpacking for as long as I can remember. Three years ago I moved to Idaho U.S.A. discovering new environments: wilderness, arid lands, forest, mountain, and snow. I also started to learn rock climbing, ice climbing and mountaineering. Because of many contacts I had with the military I thought they had the best gear available but I recently befriended some hikers and became aware of lightweight backpacking. I'm slowly migrating to that style and learning more about the various environments surrounding me. I'm testing the small bag with the dimension of 10 * 20 in ( 25 * 51 cm). The color is anthracite which is a sort of dark green and is a bit see though. The volume is 20 l (1,220 cu in). The bag also exists in 50 l (3,051 cu in) and 80 l (4,882 cu in) with a different color for each model. The bag is a roll-top dry-bag made out of 40D (1.1 oz) [31g] Ripstop silicone impregnated nylon. The base is round and allows the bag to stand by itself. The base is made out of the same material as the bag. It is sewed to the wall of the bag and the seams are taped seam sealed making them waterproof. The bag is closed with a snap closure using a UTX duraflex fastener. The fasteners are sewed to the bag with 0.75 in (2 cm) webbing going all around the opening. There is absolutely nothing else to the bag, it's a roll-top dry-bag in the most simple way. The fabric feels soft and the bag appears to be well constructed with no hanging treads or bad seams. The bag doesn't come with any instructions. The only documentation provided is information on the warranty: Vargo Outdoors guarantee's their product for the lifetime of the product against material or workmanship defects. There is also a quick description of the bag and the other sizes available. The same information is found on Vargo's website. So far I have only tested the bag at home. I stuffed it with some of my gear. I then rolled the top down three times and closed it. I filled up the bath tub with water and put the bag in. It floated and seemed to do fine. I then decided to submerge the bag just deep enough so that the whole bag was covered with water. Bubble's were escaping from the rolled top so I took it out of the water. After drying the outside of the bag with my towel I then opened up the bag. My gear inside was wet. I did the same test but with the bag just filled up with air. I noticed that I needed to roll the top about 5 times before the bubbles stop getting out from the top though not stopping completely. I also noticed that air was getting out through different spots located around the bottom seam. I filled up the bag with water and it was holding it quite well without major leaking, I didn't fill it too much though because I didn't want to run the risk of breaking the bag. I know those tests were a little bit extreme but I was surprised how wet my stuff was with the top rolled three and five times and only two little submersion's. I decided to contact Vargo's customer service and emailed them what I did with the bag and the results. Just an hour later they answered, and told me that they considered the bag to be defective and to send it back to them as they will replace it. This waterproof stuff sack seems to be well made but I'm a bit disappointed of its performances during the home test. Mostly because the bottom seam is leaking air but I'm excited to take it with me backpacking and certainly canoeing too. I'm a little bit concerned that there is no waterproof sealing at the opening of the bag. But I will see how it perform once I receive the new bag. I want to see how it will protect my gear over time. The bag seems a bit big for just backpacking or day hiking because I like to separate gear in my pack instead of having everything in a dry bag. But having to roll it at least five time to make sure my equipment will stay dry reduces already the size quite a bit. I will see if it's an inconvenience over time or not and if I can easily get the air out of the bag before closing it because no air release system is provided. I would like to thank Vargo Outdoors and Backpackgeartest for this opportunity to test the Restex Ultralight Drybag. I took the Restek drybag on a few day hikes and one overnighter. The first day hike was in the snow but all the others were in nice and dry weather. Each time, the bag was use as a liner for the equipment in my backpack. April 11: Day hike at West Mink Creek, south of Pocatello, Idaho. Altitude of about 7000 ft (2150 m) temperature of about 37 F (3 C). The snow on the trail was packed up but outside the trail it was up to my thigh. We had a lunch in the snow. April 14: Little hike on North Menan butte near Rexburg Idaho. Altitude of about 6000 ft (2000 m) and temperature of about 35 F (2 C) . The trail was covered with snow but it wasn't deep except just before the rim of the volcano. May 14-15: backpacking trip to Twin Bridges near Heise, Idaho with a little day hike near Kelly Mountain. Altitude was around 6000 ft (1830 m). The weather was nice a little bit cloudy but still warm around 65 F (18 C) but the night was cold around 32 F (0 C). First of all I would like to give an update on the return to manufacturer of the first bag. I talked about it in my initial report and after sending back my dry bag to the manufacturer, I waited over three weeks with nothing coming up in my mailbox. After about three, four weeks, I sent an email to the manufacturer, who answered me the next day. Apparently they forgot to return me a new bag and were going to take care of it right away. One week after this email communication I finally received my new bag. The new bag has the same color, size and weight as the first one. This gave me only about a month to test the bag. The first step I took after receiving the new bag was to trap some air in it, close the bag and squeeze it a little bit. The bag let the air escape even more than the first one I had so It confirmed what I though, that it isn't a product defect but a flaw in the bag design. The Restek dry bag is not air tight and therefore not waterproof either. From the tests in the initial report and the same with the new bag, I'm not trusting the Restek dry bag for keeping my gear dry in extremely wet environments like canoeing. I'm currently using the bag as a waterproof liner in my backpack and it's doing the job well. The size of the bag is great for the few clothes and equipment which I'm bringing on a day hike or overnighter. Because the bag is not air tight, it is not a problem closing the bag with some gear in it and squeezing the air out of it to have a minimal size in the pack. Up to now the bag was enough to protect my equipment from the wetness of the snow. Eastern Idaho is not really a rainy area at all so I didn't have the opportunity to test the bag in a downpour and wonder if it would correctly protect my gear. The bag is decent to protect gear from wetness but it won't be enough for a constant water environment. The bag otherwise does not show any sign of wear as I had it only for a little over a month. The Vargo Restex Drybag is a very light stuff bag for protecting my gear in my backpack from humidity but it does not perform correctly as a dry bag. Over the next two months I will test how the bag will withstand wear. I don't think I will face any rainy days, but I have a lots of hikes and ovenighters plan for next month, so a rainy one would be a great test opportunity. I used the Restex Ultralight on three additional occasions: two overnights and one 4 day camping trip. The first overnight was near the Heise, Idaho area. This is a mountain area at about 6000 ft (1800 m) but I slept in a field. The weather was nice and warm but because it was still spring the night was relatively cool. My camping trip was in a mountain canyon near Palisades Reservoir on the border between Idaho and Wyoming. It was a forested area with thick vegetation. The temperature was on the warm side but throughout the trip I received 4 big thunderstorms. My final overnight was again at Twin Bridges near Ririe, Idaho for a Scout camp. The weather was warm but I was afraid a thunderstorm would come through the night. On my two overnights the weather was nice so it was not a great opportunity to test a dry bag. On my camping trip, I was greeted by some thunderstorms so I used this opportunity to test the bags waterproofness in a backpacking situation. I left my backpack out in the storm. My backpack and the bag were wet but my clothes inside the dry bag stayed dry. I also didn't notice any signs of wear or tear after using this bag for over three months on all my backpacking/hiking trips even though the drybag was nicely protected in my backpack. 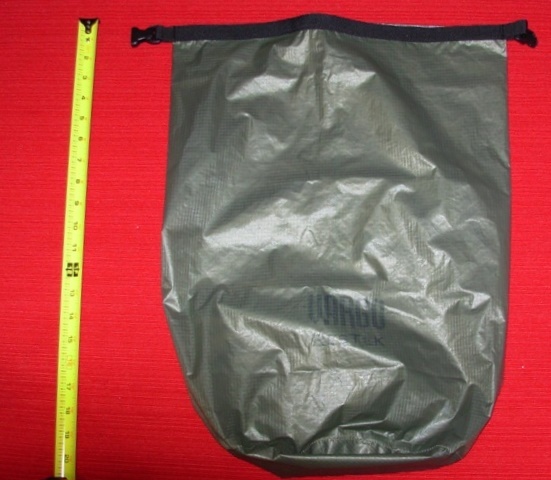 The Vargo Restex Ultralight Drybag is a nice bag to protect my clothes in a backpack. It is very light and the fabric is resistant for my normal use. Even if it was enough to protect my clothes in my backpack from rain, I won't take it on a water trip. Most of my outdoor playgrounds are in Idaho and don't receive too much rain during the summer time so I will continue to use it to protect my equipment from a possible light rain. During the winter I will see if I'm able to keep my gear dry despite of the snow and maybe decide to get a heavier but more waterproof bag. I would like to thanks Vargo and BGT to allow me to test the Restex Ultralight Drybag.